Ham Rong Mountain looks like a giant mouth facing the sky when seeing from the far distance. It is said that this is the dragon head, which is turned into stone. 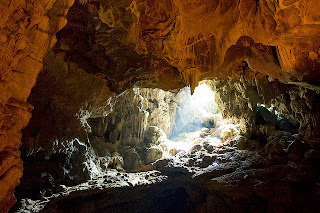 In one side of the cliff, there are two big cave entrances, which are parallel to each other and called Ham Rong cave. About 500m from Muong Khuong district, Lao Cai province, there are two mountains emerging and created two vertical cliffs. Between them is Muong Khuong – Pha Long road which is called Ham Rong by local people. The entrance is wide and deep with the various stalactites in different colors and shapes, which encourage people’s imagination. The main cave has the spiky stalactites, which are like dragon’s teeth. In winter, water spume from this entrance creates the clouds and an illusory beauty. There is a connected way between two entrances. Inside the cave, there is a wide way of 1.5km long crossing the mountain to the third entrance, which looks like an ear of the dragon. The dome would reach 20m. There are many groups of stalactites in the dome and under the floor which are very plentiful and various. Some of the group has luminescent when there is sunlight. In dry season, there are still underneath water line in the cave and it appears suddenly in the cave. In the rain season, the water from the spring of Muong Khuong flows to the cave entrance and release to the fourth entrance cave to create the Pao Tung waterfall with the height of hundred meter. From the cave of Ham Rong, crossing the slope of 9 handles, visitors in Vietnam tourism could reach Mao Chao Su hamlet. About 1.5km from the path of the people doing the terraced field, there is another cave called Mao Chao Su. This is one of the places to honor and worship for local people. The entrance gate faces the South East, in front of the cave is a wide valley, which is the settle place of Na Mang village, and it is like a landmark for the grandiose mountains. The entrance has two bamboo groups, which helps the cave beautiful in a private way. There is no similar thing between the outer and inner part of the cave. The cave is quite big with hundreds of people could be contained, and people could feel the maze is appearing in front of the eyes. Perhaps the underneath water line and the wearing out of the water, the stalactites are created in high density. The water drops from the top of the stalactites and created the sparkling lines in the shape of windy curtain. The cave shape is more and stranger with the shapes of stone lines, which aare connected to the floors like the terraced field of local people. There are some big pillars, which are separated into the equal conk of stalactites, and when you knock on them, there would be nice sounds and echoes back. On the cliff of the cave, there are white stalactites, which are like the rice bundle. There are shapes of statues, patterns, etc that create a splendid view. If Ham Rong cave is magnitude with the firm stalactites, the stalactites in Mao Chao Su are delicate, smooth, and pure like the crystallized salt. There are some stone and stalactites created in the equal thick to form the wattles among the long house. Mao Chao Su cave is not long but the stalactites are gorgeous and impressive for anyone. Mao Chao Su has many more things to say. 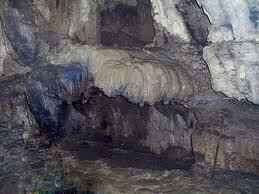 Besides, there are many caves like Muong Ngua cave, Lung Pau cave, etc. Ham Rong and Mao Chao Su are two of the complex of cavees and caves in Muong Khuong district which is beautiful for the complex of various and wild cavees. This mountainous area has many beautiful things and cultural features, being waited to discover.